Sunsational Sunburst Outdoor Privacy Screen - The Sunsational Outdoor Privacy Screen is weatherproof and can be used virtually anywhere. 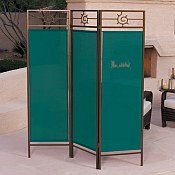 Use the Privacy Screen on the patio, around the pool, deck, porch, garden, balcony or even indoors. Simple assembly even gives you the opportunity to take the screen with you on vacation if you wish. 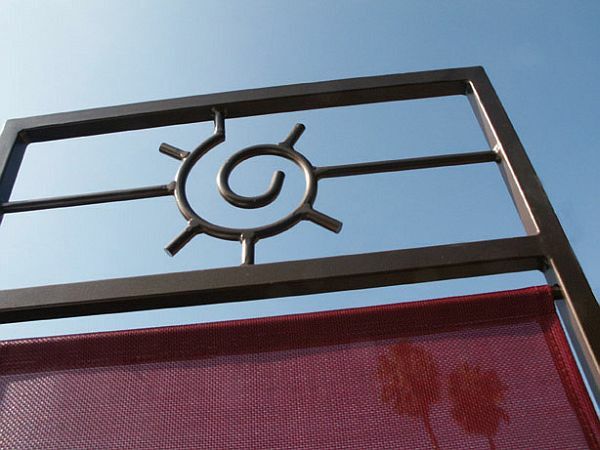 The Sunsational Privacy Screens are made from Powder Coated Weather Resistant Steel. The Sunsational Select fabric is a solution dyed acrylic fabric that is mildew, UV and fade resistant and is easy to clean. These versatile privacy screens can be used on wood, concrete, grass, dirt or even carpet. Each Screen comes with 1 shelf, 4 planter rings and mounting brackets for permanent installation if so desired. 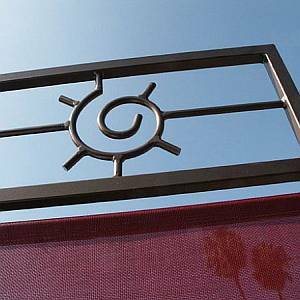 Privacy Screen frames are available in 2 styles, the Sunburst and Contemporary with the Sunburst available in a White or Black frame finish and the Contemporary is available in White, Black and Bronze frame finishes. The Marine grade polyester Select panel fabric is available in eight colors: Blue, Burgundy, Green, Yellow, Beige, Black, Sage, and Terra Cotta. 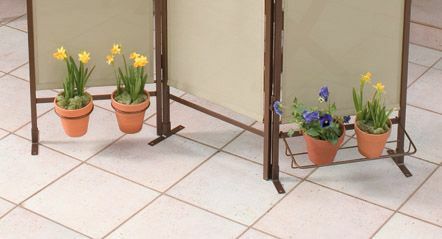 Each patio privacy screen comes with 3 connecting panels, overall dimensions are 55" W x 72" H. Each individual panel measures a little more than 18" wide. The Sunsational Privacy Screens are easy to assemble (approximately 20 minutes) and are a beautiful and practical addition to any yard, patio, deck or home.